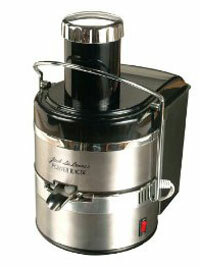 The Jack Lalanne juicer is one of the most celebrated American brands of juicers. These juicers have been featured extensively on American television and in the media as well as being endorsed by many celebrities. There is very little design difference in any of the five makes of Jack Lalanne juicers, they are all very compact making them suitable for leaving out on the worktop. The main difference between the juicers is the variety of features, finishes and price. This is a well-priced entry-level juicer that will enable you to do all types of juicing, apart from juicing wheat grass. The high output motor (3,600-rpm) and surgical stainless steel blade provide maximum performance with very little noisy. All Lalanne juicers motors come with a lifetime guarantee, now that has to give you peace of mind and shows how confident the manufacturers are about their juicers. Its large feeding chute can accommodate many whole fruit and vegetables, although some larger fruits need cutting up. All models come with an extra large pulp catcher. This is a real bonus for a centrifugal juicer as many makes of centrifugal juicers hold the pulp inside the machine. With the Jack Lalanne power juicer the pulp is ejected, perfect for disposal or for using in your baking. This also means your juicer will not clog up and need emptying half way through juicing. Cleaning couldn’t be easier than with the Jack Lalanne juicers, because all of the juicer parts can be washed in the dishwasher. Just make sure you place everything in the top basket of the dishwasher just to make sure nothing falls onto the heating elements. You can also buy a special cleaning brush that makes the job even easier. The extra feature on this model is the non-drip spout that allows you to get every drip of juice out of your juicer. This juicer is only available in white. For more information on Jack Lalanne powerjuice express. This is the same as the power juice express but comes in a stunning stainless steel finish, great for keeping it looking good for many years. Read more information on Jack Lalanne powerjuice deluxe. This juicer has all the features of the deluxe model with an added benefit of a stainless steel mesh that helps to give you super smooth juice without any of the bits. For more information on Jack Lalanne powerjuice pro. With all the features of the previous four juicers and the extra soy technology this is the most expensive Jack Lalanne juicer. If you are looking for a juicer that you won’t grow out of then you might want to think about making a little extra investment and purchasing the power juice elite. The soy technology allows you to juice whole cherries, peaches, plums etc without having to remove the stones first. It also has the capacity to make soy, rice and almond milk. Find out more about Jack Lalanne powerjuice elite. The great thing about the Jack Lalanne juicer range is there is something there for everyone depending on your budget and how much you want your juicer to do. I really do feel that the extra money spent on the stainless steel finish is worth it as juice stains can be hard to remove from white plastic. After all your juicer is going to last you for years and is best kept out on the work surface for easy use. The main feature that I really like with all these centrifugal juicers is the fact that the pulp is ejected from the juicer allowing you to juice as much as you like without having to stop and empty your machine part of the way through. This is really great if you’re planning to juice for the whole family. This only leaves me to rate this range of juicers and because there is something here for everyone I’m giving the range a four and half star rating.